124 pages | 14 B/W Illus. Letters to a New Student is a study skills book with a twist. You decide how to read it. Based on a series of short, informal, problem page letters that you can read in any order, the book uses principles of human psychology, teaching, and coaching practice to offer a refreshing approach to study skills and learning techniques. The letters form a brief ‘survive and thrive’ study guide to work smarter not harder and offer advice on topics such as motivation, stress, revision, and assignments. It’s a tried-and-tested, blueprint to make information stick with less effort. The book takes a holistic approach to learning. It covers health and wellbeing, the ‘nuts-and-bolts’ shortcuts, the obstacles, and the pitfalls. It also includes short learning principles and cross-references to other entries, with practical advice in response to the frequently asked questions many students ask during their studies. Letters to a New Student is for any student under pressure, parents and family who want to offer support, or anyone with interest in lifelong learning. It’s written by a psychologist, teacher, academic coach, and advice columnist, with over 20 years professional experience. ‘Best years of our lives? Hardly. Being a student these days is no picnic. It’s hard work; it’s emotionally draining; it’s complicated; it’s expensive. This book is written by a guy who wants you to enjoy your student experience, to get the best out of it and – at the very least – to survive your higher education experience with no permanent scars. The book is easy to read and packed with the kind of tips that come from someone who has lived through his share of problems and learned from them. Highly recommended.’ – Professor Trisha Greenhalgh, University of Oxford, UK. 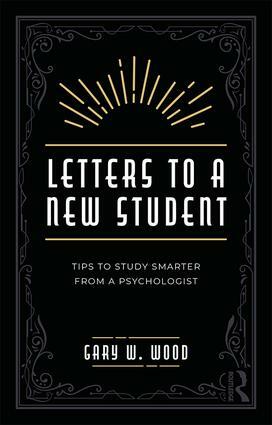 "Letters to a New Student has an answer to most questions and worries about studying: “Is my addictive personality getting in the way of my learning?”; “How can I clear my head and boost my mood?”; and, most importantly, “Should I be using highlighter pens?” Dr Wood also knows better than to just focus on the act of studying itself and dedicates a generous number of pages to the student’s general wellbeing and how this can impact one’s academic performance. 1. An intro of sorts. . .